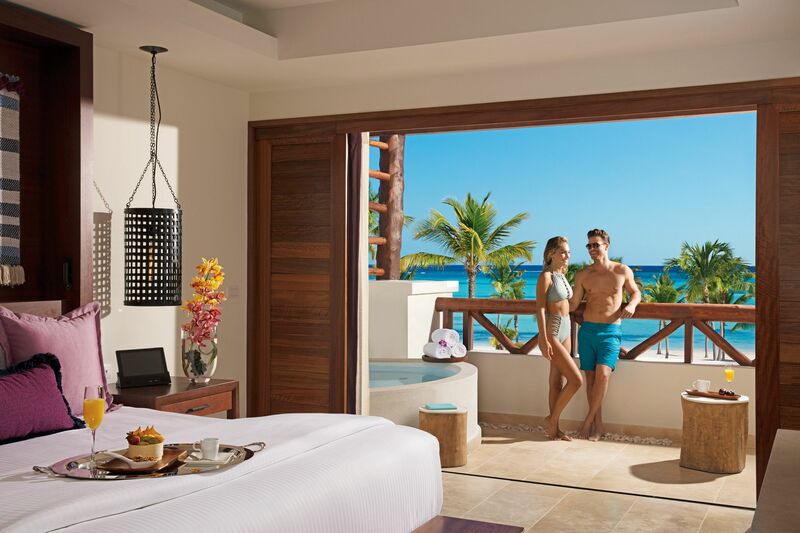 Punta Cana honeymoon suites with outdoor jacuzzi and private pool features are extremely for honeymoon couples and other romantics that want to have a special room. Suites with Jacuzzis in the room are very close to becoming the standard with new resorts. Punta Cana has a large supply. Most of the resorts in Punta Cana are new, modern and have built accommodations to attract travelers looking for something beside a bedroom and a bathroom. In 1948, Candido Jacuzzi developed a submersible bathtub pump for his son suffering from arthritis. Who would have thought 69 years later this tub would be synonymous with relaxation and romance? 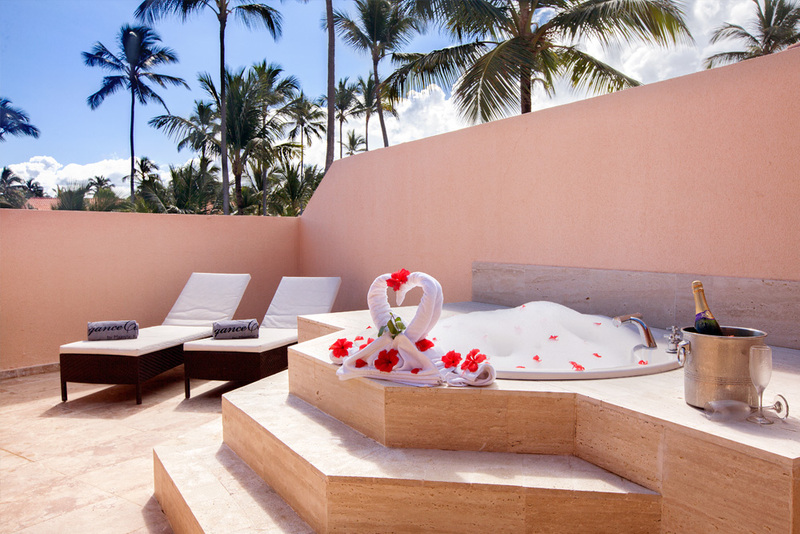 Below is a list of your favorite resorts that have outdoor Jacuzzi suites in Punta Cana. Secrets Cap Cana sits on an amazing beach and has several suites to choose from that have outdoor jacuzzis and private pools. The swim out suites are also special here. Secrets Royal Beach is a luxury adults only all inclusive resort in Punta Cana. Almost every room category here has a jacuzzi on the balcony or patio. 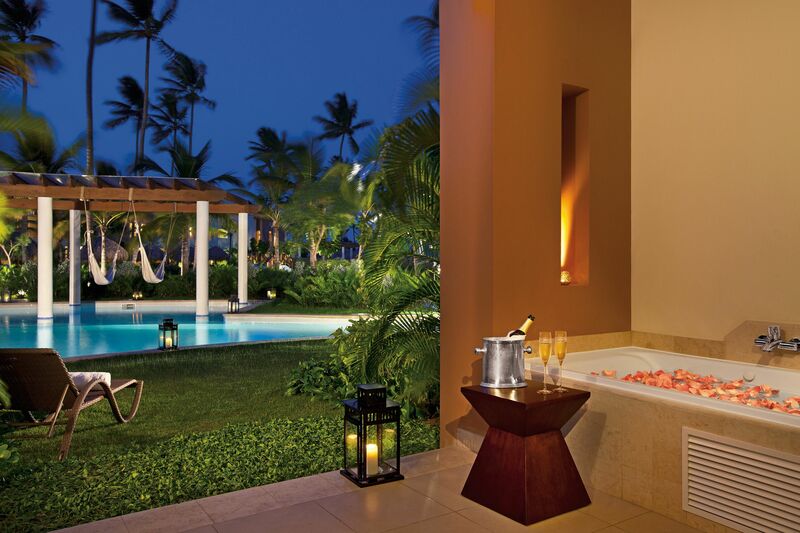 One of the most unforgettable honeymoon suites in Punta Cana is the Preferred Club Master Suite Ocean View. 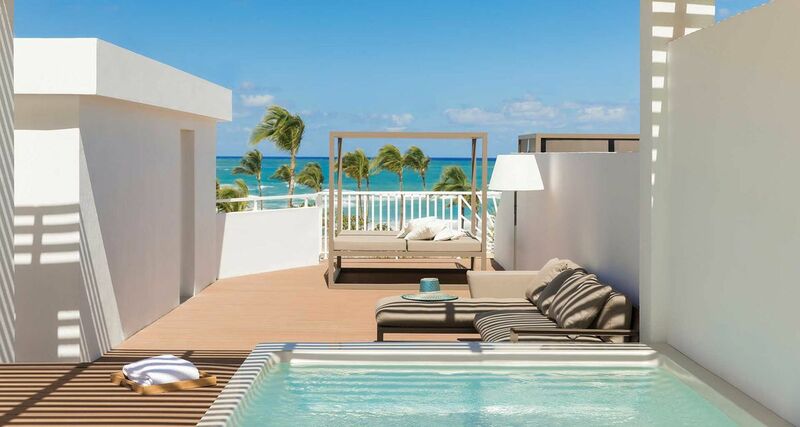 Excellence Punta Cana and the new Excellence El Carmen have their famous Rooftop Terrace Suites. These terrace suites have stairs to the roof, where your exterior "HydroSpa" awaits. They both also now have suites with private pools. 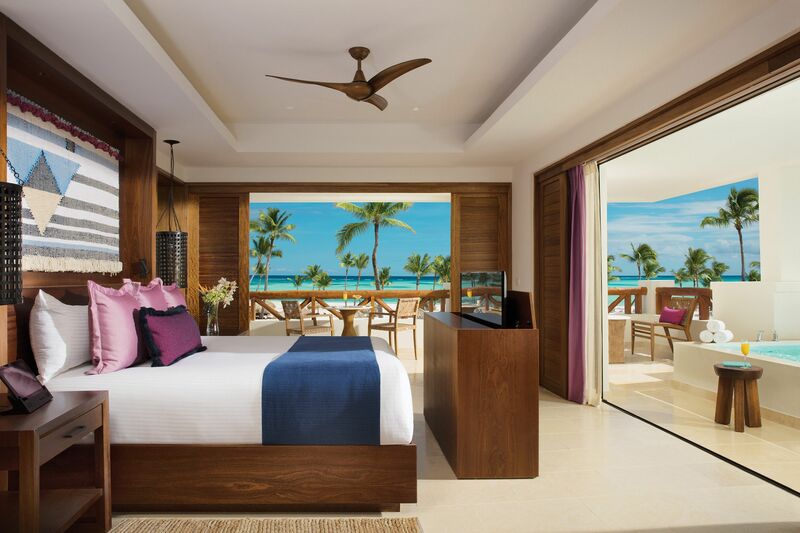 These are the most popular Punta Cana honeymoon suites for us. Both resorts are high end luxury and adults only. Breathless Punta Cana is a very unique adults only resort. This resort caters more to you if are looking for a Fun resort. This resort is very active and lively. We send honeymoon couples here, because it is very luxurious and nice. More often than the honeymoon, we send groups here to do bachelor and bachelorette parties. The Majestic Elegance Punta Cana, Majestic Colonial Punta Cana and the new Majestic Mirage have several room categories with outdoor jacuzzis and are affordable. These 3 resorts accept all ages, but have adults only sections. If you are looking for the most affordable Punta Cana honeymoon package. Check out the Riu Resorts. 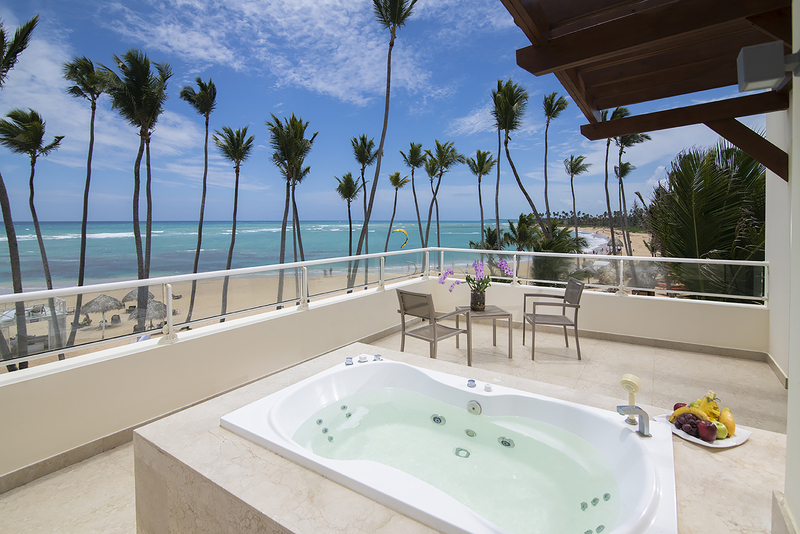 Riu Palace Macao, Riu Palace Bavaro and Riu Republica all have suites with outdoor jacuzzis. We love the price of the Rius. They also have a new big water park that all the Riu guests can use. This park has been a big hit for all ages. Call us early to avoid disappointment, so we can put a little extra romance in your life. The honeymoon suites with outdoor jacuzzi will add some spice. The nicest suites are the first to sell out.